We install awesome into your home or cottage. Music? We love it. Couldn't survive a day without it. Sound familiar? Then we should talk. Because your music will sound new again with audio system from Creative Audio. Whether yours is a student budget or dream budget - we've got you covered. Movies? Video games? Netflix binges? We make these good times even better with our systems designed with big screens and out of this world picture quality. Yes - we do great video, too! Smart home? What's that you ask? A smart home is a home that saves energy with integrated automation technology. We love technology. Except when it gets in the way. Nobody has time for that. It has to be easy to use. Right? That's where Creative Audio comes in, with our custom designed and programmed automation systems. As easy as a light switch. We promise. Still with us? Then read on...we've only just started! Winnipeg has trusted Creative Audio with its music for over 40 years. Our reputation is built on our experience and expertise designing systems from a carefully handpicked selection of electronics and speakers. Your music. With you. Always. That is multi-room audio, designed and installed by Creative Audio. Now obviously great sound comes naturally to us. It's our thing. But it's not enough. In your home the look is the thing. Through the choice of materials to careful observation of sight lines, we don't merely compliment the beauty of your home - we enhance it. It's this level of detail that sets us apart. We are just as meticulous with our custom-designed interfaces on in-wall touchscreens and your smartphone and tablet. After all, if it isn't easy to use - what's the point? Some rooms deserve special treatment. Like the home theater. Or media room. Or man cave. Call it what you like, we will make sure it's the most popular room in your home. And what about outside? A Winnipeg summer is a summer spent outside. It's one big party. And what's a party without music? Don't worry - we've got you covered. Of course we haven't forgotten our heritage: good old hi-fi. Whether you're spinning vinyl or streaming digital we will build for you the best system you've ever had. And for music on the go we've got a great selection of headphones too! Awesome sound. Everywhere. It's what we do. Escape and explore new worlds. When you're known for providing the best sound in the city, the challenge is making sure the picture looks just as good. Challenge accepted. When you have a reputation for providing the best sound quality in the city, you can't let the side down. And we don't. In fact the dazzling video quality of our systems will probably distract you from just how good the sound really is. We work behind the scenes for you, making sure your system is 4K and HDCP 2.2 compliant. So don't worry about that. You just focus on the amazing picture quality in every room at every size. Just like our audio systems, every room will get the video treatment it deserves. From massive projection screens in the home theater to sleek curved flat panel displays in the great room to screens hidden behind mirrors in the en suite, Creative Audio will make sure your video system is tailored perfectly to every environment. STUNNING IMAGES. Every TIME. It's what we do. "This company has integrity and is a pleasure to work with." - Brian S.
Make your home more energy efficient with a smart home automation system from Creative Audio. Automated lighting control is the cornerstone of our systems and the average energy savings from dimming alone are 20%. Not only will you save energy but you will also significantly increase bulb life as well. If we incorporate your blinds and thermostat into your automation system, you can reap even greater efficiencies. In the winter the system will open the blinds during the day to let in the natural heat of the sun but in the summer it will close the blinds so your air conditioner doesn't have to work as hard. Whether it's setting all the lights - inside and out - to the perfect level for a party, or not having to explain to the in-laws how to use the TV - thanks to the simple, easy-to-use single remote control - your smart home automation system will save you time. You can control all of the systems of your home from a single app on your smartphone or tablet. Some things you don't need to control. The outside lights, for example, will come on automatically when the sun sets and turn off when it rises again. If your surveillance cameras detect any motion they will text you a snapshot of what they see. This is your home, working for you. 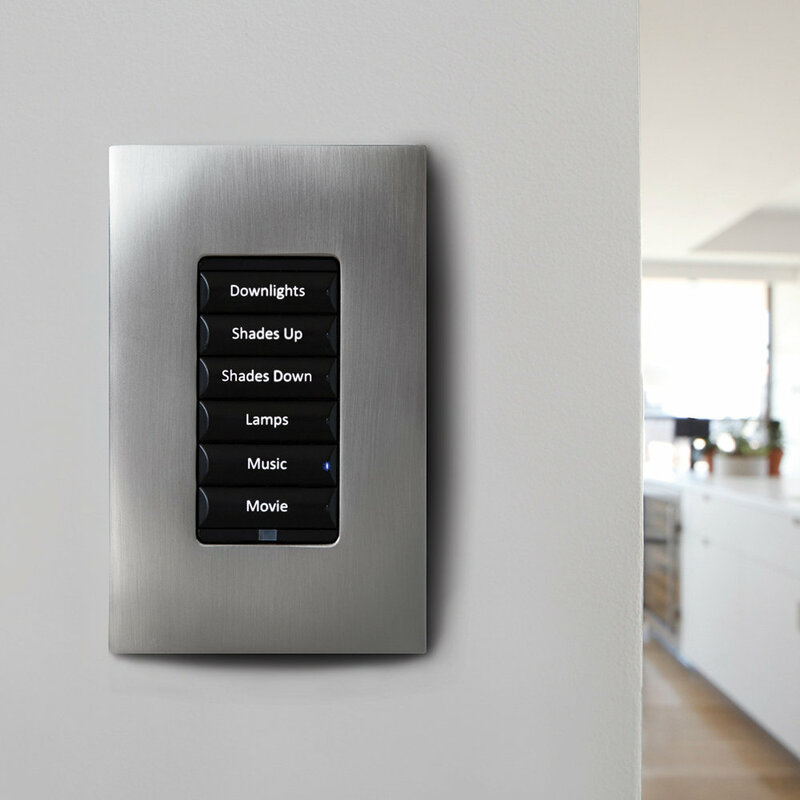 With an automated control system, we can hide all of the electronics that power the entertainment in your home. And then there's the walls - how often have you seen the clean lines of a new home ruined by an ugly wall covered in mismatched controls - light switches, security panels, and thermostats. Who wants to see that? Let us clear the clutter with an in-wall touchscreen that controls all of those systems and more. It's even smart enough to know to go straight to the security panel screen when you return home. Cool, huh? This is how a smart home automation system adds beauty and value to your home.